Some say these are the devilfish of the fish tank, some say its the untreated waters of Hong Kong. Who knows the truth? 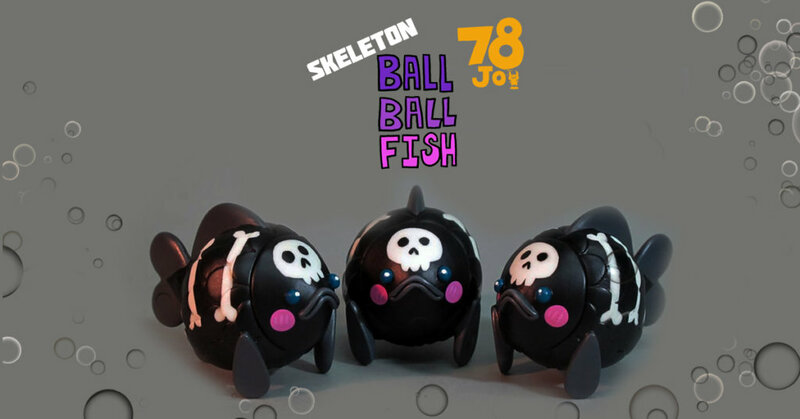 We don’t but what we do know is Sunny Tam of 78JO has released Skeleton Ballball Fish! could this be his Ballball Fish just embracing Halloween? Sunny Tam has released them into the wild, but make sure you act fast to catch them as they are limited to 8 pieces. We can totally see more variant being released into the wild in the near future. What colours or varieties would you like to see? Answers in the comment section below. Please leave a message Sunny via Facebook or Instagram. Hong Kong. Only a handful of Ballball Fish remain. We want to congratulate Sunny Tam for creating Ballball Fish and showing us there’s nothing to be ashamed about having a round body and rubber lips Ha Ha HA. Stay tuned for further info. Find Sunny via Facebook and Instagram.